We’d love your help. Let us know what’s wrong with this preview of Under a Maui Moon by Robin Jones Gunn. Carissa doesn’t know who she is anymore. She and her husband, Richard, are recent empty nesters; Richard is spending more and more time at work counseling his volatile clients and less time at home with his wife; his clients are starting to show up at the house at night causing Carissa to feel scared in her own home; and to top it all off, Carissa’s boss informs her that s Carissa doesn’t know who she is anymore. She and her husband, Richard, are recent empty nesters; Richard is spending more and more time at work counseling his volatile clients and less time at home with his wife; his clients are starting to show up at the house at night causing Carissa to feel scared in her own home; and to top it all off, Carissa’s boss informs her that she’s been “let go.” She wonders where God is in all of this since He doesn’t seem to be around to protect her—and she’s already stopped trusting her husband. In the midst of her world tilting off center, she’s offered time at a hideaway on Maui. Hiding seems like the best way to respond to life’s overload, and the thought of being alone sounds like just the right balm to soothe her wounded heart. The languid Hawaiian sun, white beaches, and warm-hearted people bring respite, but meeting handsome Kai causes Carissa to toy with the idea of being romantically involved with him. Then, under a Maui moon, she looks to God for guidance and hope for the future. That’s when she discovers His hand still is on her life, and that love is closer than she ever realized. To ask other readers questions about Under a Maui Moon, please sign up. Mrs. Gunn's books are always so peaceful and uplifting. They help refresh and restore my soul. All the characters were brought to life and folks I would like to meet. I look forward to hearing more by this author. I enjoyed this book, it's a nice light read that includes wonderful descriptions of Hawaii. Carissa and Richard’s marriage is falling apart. Neither one of them are communicating well with each other, and the last straw is when an intruder appears at Carissa’s home and Richard takes the side of the intruder and doesn’t validate Carissa’s concerns. To make matters worse, Carissa goes to work on Thursday and discovers that she’s been “let go,” with one of her employees nieces taking over her job effective immediately. One of the doctors that Carissa worked with is kind enough to hand her keys to his Maui house so Carissa and Richard can go and have a “second honeymoon.” But with the death bells to their marriage tolling, Carissa makes arrangements to go by herself, figuring it is the first step to leaving Richard—before he leaves her. The people in Maui are friendly, and Carissa soon finds herself attracted to handsome Kai. She’s toying with the idea of becoming romantically involved with him when God shows that His hand is still on her life—and love is closer than she realized. UNDER THE MAUI MOON is not the fun type of read that the Sisterchick series, but it still takes us to a romantic destination and gives a literary tour of this vacation spot—perfect for those of us who can’t afford to go on their own. Carissa and Richard were both at fault with the downward spiral of their marriage, but neither one of them wanted to be the ones to take the initiative to make it work. I couldn’t help but care for this struggling couple and hope that they find ways to make their marriage work. 224 pages. $14.99. 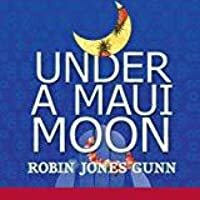 Just like every other Robin Jones Gunn books I've read, Under a Maui Moon was a very enjoyable read. There were a few things that were strange, but overall I like it a lot and would recommend it. Thank you to Simon and Schuster for a copy of Under a Maui Moon by Robin Jones Gunn. I was given this copy in exchange for an honest review. Who likes vacations? I know I do. I would also say cancer sufferers love vacations even morel. What would be your favorite destination? I know that I have been wanting to travel out west again. This time I plan to visit Maui. So I invite you to come with us to Maui! Carissa is an office manager for a busy medical practice in Portland Oregon. One m Thank you to Simon and Schuster for a copy of Under a Maui Moon by Robin Jones Gunn. I was given this copy in exchange for an honest review. Carissa is an office manager for a busy medical practice in Portland Oregon. One morning she walks into work to find that a meeting has occurred. What did the doctors meet about? It does not take long for her to find out. Dr. Walters comes to see her and lets her know that she is let go from her job. He hands her a key and says that he will fill her in on what the key is for tomorrow after she finishes packing up her office. Once home she is also having conflict with her husband Richard. His psychiatry practice is what upsets Carissa. He tells her to discuss it with her boss again tomorrow because they need her pay check. Then there is the other problem of his clients showing up after hours, at their house. The next day Dr. Walters explains that the key is for cottage on the island of Maui. The purpose is to give Carissa time to clear her head and decide what is next. What will her trip have enstore for her? Will she be able to heal the rift between herself and her husband? 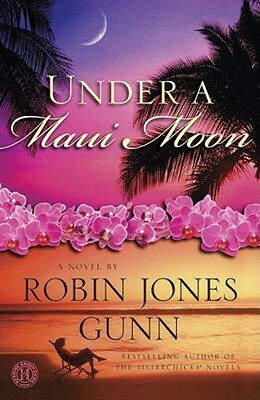 I really enjoyed Under a Maui Moon by Robin Jones Gunn. It is set in a great location! I loved how the author really took us the readers on a journey into Carissa’s life. The readers will turn pages to find out how the story will resolve. I also loved how she integrated the bible into the story. I think the author hit on a key issue with many Christ followers. Are we willing to seek and trust God in our life? Can we forgive those who have wronged us or let God be the tunnel? Please visit Robin on her Facebook page, Twitter, and her Website. I wish this book was around when my parents were going through their marital struggles. Things would've definitely worked out differently. It's amazing how God picks us up when we fall. The temptations we face are very real, but God's power is greater. Praise God! I give this a 3.5, very light but I enjoyed reading about many places I've visited at my second home. Really enjoyed it! It was also nice to see glimpses of other favorite characters from other books by the author! Empty-nesters Carissa and Richard should be coming into a wonderful place in their marriage, but counselor Richard's explosive clientele threaten Carissa. When she loses her longtime job on top of tensions with Richard and his devotion to his job, her retiring boss offers use of his house in Maui and she jumps at the chance to go--alone. Gunn weaves a tale of marriage on the rocks and distancing from God in the Hawaiian paradise with endearing characters. Each chapter begins with a verse written Empty-nesters Carissa and Richard should be coming into a wonderful place in their marriage, but counselor Richard's explosive clientele threaten Carissa. When she loses her longtime job on top of tensions with Richard and his devotion to his job, her retiring boss offers use of his house in Maui and she jumps at the chance to go--alone. Gunn weaves a tale of marriage on the rocks and distancing from God in the Hawaiian paradise with endearing characters. Each chapter begins with a verse written in Native Hawaiian and in English, which adds much to to the setting. Reading this story, I was overcome with hope and could almost feel the breezes and smell the pineapple. I love how Gunn tucked in the history while developing well-written dialogue and characters. It is a story that kept me guessing as to how it would resolve and one I recommend. Published review in Church Libraries Journal, Fall 2010, by Crystal Laine Miller. Carissa Lathrop is lounging in her backyard with her dog when she hears a prowler. She calls her husband, who seems to know who the prowler might be and then 911. Shortly after the cops arrive her husband does and goes right to the suspect and begins talking to him. It turns out to have been one of his counseling patients. Carissa is upset that his practice has come to their home and that her husband's first thoughts are for the patient and not her safety. This is the surfacing of a tension in t Carissa Lathrop is lounging in her backyard with her dog when she hears a prowler. She calls her husband, who seems to know who the prowler might be and then 911. Shortly after the cops arrive her husband does and goes right to the suspect and begins talking to him. It turns out to have been one of his counseling patients. Carissa is upset that his practice has come to their home and that her husband's first thoughts are for the patient and not her safety. This is the surfacing of a tension in their marriage. When Carissa loses her job the next day and gets an unexpected offer to spend time in Maui she takes advantage of it to rethink her life and make some decisions. She makes some new friends, searches her soul and tries to reconnect with her spiritual self, while evaluating her relationship with her husband and their future. Nicely introspective novel. Not a bad read. Carissa and her husband are going through a rough patch in their marriage when Carissa is informed that she is being let go from her job because their basically downsizing. Her old boss gives her the key to his cottage in maui an tells her to take a vacation there and get some rest etc. Carissa's husband is out of town on business and she decides to jump at this once in a lifetime opportunity to evaluate what her marriage has become etc. Next to this cottage is her old boss broth Not a bad read. Carissa and her husband are going through a rough patch in their marriage when Carissa is informed that she is being let go from her job because their basically downsizing. Her old boss gives her the key to his cottage in maui an tells her to take a vacation there and get some rest etc. I have always enjoyed reading Robin Jones Gunn; she writes fun inspirational chick lit which is great for a light read. Sometimes I have wished her characters would be a bit more developed, and in this story I was pleasantly surprised by more depth that I remembered from her other books. I’m not sure if it’s because there are fewer main characters than in some of her series or because the subject matter is so near to her heart, but I was very impressed and encouraged by this story about a couple I have always enjoyed reading Robin Jones Gunn; she writes fun inspirational chick lit which is great for a light read. Sometimes I have wished her characters would be a bit more developed, and in this story I was pleasantly surprised by more depth that I remembered from her other books. I love stories about marriages that make it through the tough times. Robin Gunn has done it again as she's crafted a story about characters who struggle with real-life issues, and placed her story in a beautiful setting like Maui. Her colorful secondary characters add depth and dimension to a story that could have been very generic. I appreciate how Gunn dealt with real heart issues in such a sensitive, realistic way. Loved this book. I love reading Robin Jones Gunn's books about Hawaii. She paints such a beautiful picture of the islands and makes you feel like you are there. The story line was just okay for this one. The character development was great as Carissa dealt with issues from the past and made some big changes and decisions regarding her marriage. I'm not sure why, it was just a difficult book to get into and relate to. Another great summer read. SOOOOOOO makes me want to go back to Hawaii someday. Quick read, glad that the character gets stuff figured out. Not saying more, dont want to give anything away. Not as good as the sister chick books, as there really isnt humor in this one, but I love when authors can come up with so many different type of books. This is my first and perhaps only foray into Christian romance writing--I was sucked in by the delicious cover and then just kept reading! Sort of a cute story, though the protagonist is always binge eating which is a little strange. Anyway, I enjoyed it enough to finish it and learned of a great camping spot on Maui that I plan to check out. Robin Jones Gunn is a great story teller. Carissa's marriage was in trouble, her job terminated, and her safety threatened. Carissa was given a gift .. a trip to Hawaii, her husband had a conference to attend. It seemed everything has gone wrong. God is so amazing. The characters are believable, the discriptions are beautiful, and the Hawaiian history is so interesting. I recommend this book. There is nothing a little Maui sun cant heal! Even a broken marriage.. When Carissa's and Richard's marriage hits its bottom Carissa is flying away to Maui. While she is trying to get a grip on her broken life her husband misses her and realizes his mistakes. A great read about second chances and an always-surviving Love. Motivational, Bible oriented in many instances or maybe throughout, made me stop and think and, ...stay (word used by Irene, one of the main characters, when describing how her marriage of 52 years had succeeded).